Candidates who wish to apply for this post must posess the following skill and criteria : Qualified CA / Diploma, BCA / B.Sc, B.E / B.Tech / PG Degree in Economics, MCA / M.Sc / MCS / MCM / MBA from a recognized College or Institution. Interested candidates who are appearing for this post should have the age of 50 years for Sr. No. A, 45 to 50 years for Sr. No. 2 & 40 years for Sr. No.3. Last date to receipt application on or before 29th November 2014. Surat District Co-operative Bank 1st decade of 20th century was a very important era in the history of Co-operation for entire country and Surat District as well. Many Co-operative institutions were initiated during this period. 1st Co-operative Society in Surat District was registered at Degam, Taluka Chikhli on 23th May 1906. In the year 1909, with the efforts of Late Shri B.A.Modi and Late Shri K.G.Desai. The Surat District Co-operative union Limited, was registered on 17th June 1909. 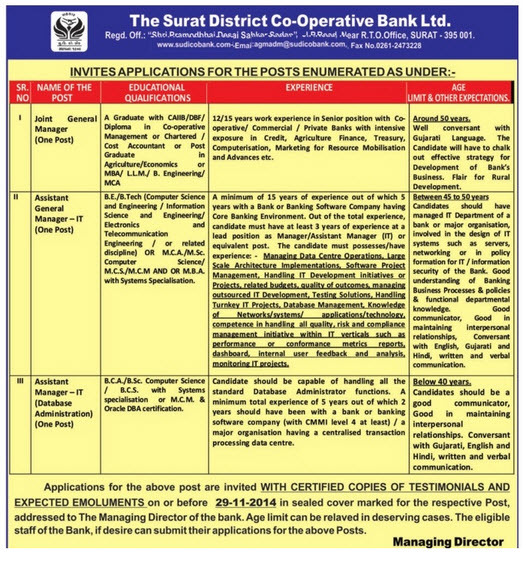 It was the institution which is later on known as THE Surat District Co-operative Bank Limited. Bank is having separate department for agriculture advances since 1944.